(1) Daughter Angelita “Angie” Arispe was born October 2, 1948 in Brewster County. In February 2011 she was living in Loving, NM. Her married name is Rodriguez. (2) Daughter Maria Velia Arispe was born December 26, 1949 in Brewster County. In February 2011 she was living in Andrews, TX. Her married name is Valenzuela. (3) Daughter Maria Teresa “Terry” Arispe was living in Carlsbad, NM in February 2011. Her married name is Bravo. (5) Child Guadalupe Arispe died soon after birth. (1) Son Roman Arispe, Jr. was born in Alpine January 20, 1950 and died there of acute peritonitis February 24, 1952. He is buried in Alpine. (2) Son Jesus Armando Arispe was born February 23, 1952 in Alpine. (3) Daughter Mary Belinda Arispe was born November 18, 1953 in Alpine. C. Daughter Elberta Arispe was born circa 1928 in Texas. In 1930 she was living with her mother and paternal grandparents east of Terlingua Creek. She was a member of the wedding party of Elena Ramirez and Vicente Urquieta in July 1944. D. Son Sebastian Arispe was born in Terlingua January 20, 1930, about four months after his father’s death. He died in Terlingua January 21, 1931 and was buried there the following day. 2. Son Pablo Arispe, Sr. was born June 29, 1906 in Mexico. In 1920 he was living in the Terlingua area with his parents and was working as a general laborer. In 1930 he was still living with his parents east of Terlingua Creek and was working as a ranch laborer. He married Isidora Yniguez November 14, 1936. She was born April 4, 1914 in Texas and was the daughter of Librado Yniguez and Anastacia Cruz. In April 1940 Pablo and Isidora were living in Shafter, where Pablo was working as a miner in the silver mines. In 1939 he worked 52 weeks and earned $780.00. They moved to Alpine in 1943. Pablo was a retired employee of the Southern Pacific Railroad. Isidora died in Brewster Memorial Hospital May 19, 1973 and Pablo died in the same facility January 16, 1989. Both are buried in Holy Angels Cemetery. Pablo and Isidora lived in the Alpine area from 1949 until their deaths. A. Son Tomas Arispe was born in Brewster County September 22, 1937. In December 1998 he was living in Alpine. B. Daughter Florentina Arispe was born in Shafter June 20, 1940. C. Daughter Maria Elena “Mary Ellen” Arispe was born in Presidio County August 18, 1942. In December 1998 she was living in Alpine. Her married name was Ramirez. D. Daughter Maria Louisa “Mary Lou” Arispe was born August 25, 1944 in Brewster County. She was living in El Paso in December 1998. Her married name was Ciaburri. E. Son Pablo Arispe, Jr. was born February 2, 1948 in Alpine. He was a graduate of Sul Ross State University and in 1968 joined the U.S. Army, with a tour of duty in Vietnam. He worked as a book keeper and a driver for the Jones Tire Testing Co. of Alpine. In 1986 he moved from Alpine to El Paso, and in 1993 he moved to Anthony, TX. He died in Anthony December 29, 1998 and is buried in Holy Angels Cemetery, Alpine. F. Daughter Ramona Arispe was born July 9, 1952 in Brewster County. She was living in Alpine in December 1998. Her married name was Hernandez. G. Daughter Linda Arispe was living in Alpine in December 1998. Her married name was Leyva. 3. Son Apolinar Arispe was born August 8, 1908 in Mexico. In 1920 he was living with his parents in the Terlingua area. In 1930 he was still living with his parents east of Terlingua Creek and was working as a freight wagon driver. He was a resident of Alpine from 1944 to 1961. He died at his residence in Alpine of pneumonia and tuberculosis December 7, 1961 and is buried in the Alpine Catholic Cemetery. 4. Son Genaro Arispe was born September 19, 1910 in Mexico. He was living with his parents in the Terlingua area in 1920 and was still with them east of Terlingua Creek in 1930. In February 1928 he was working for the Chisos Mining Co., employee number 781. On February 28, 1928 he injured his hand shaft number 9 and missed two days work. In 1930, according to the census, he was working as a freight wagon driver. Genaro died in Alpine August 17, 1987 and is buried in the Holy Angels Cemetery. 5. Daughter Maria Arispe was born October 18, 1915 in the Terlingua area. She was baptized in Chisos July 16, 1916 by Father M. Cuadrado. 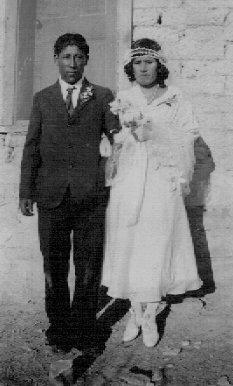 She married Estevan Rodriguez December 2, 1932 in Brewster County. In August 1987 she was living in Mexico. 6. Son Jose Arispe was born September 13, 1917 In Terlingua. In 1930 he was living with his parents east of Terlingua Creek. In April 1940 he was living with his brother Pablo in Shafter, where he was working as a miner in the silver mines. In 1939 he worked 52 weeks and earned $780.00. On September 8, 1945 he married Felipa Hernandez, daughter of Guadalupe Hernandez and Teresa Baeza. In January 1989 they were living in Odessa, where Jose died October 8, 1996. Felipa died in Odessa March 11, 2011 and is buried in Rose Hill Cemetery. Jose and Felipa had three children. B. Daughter Anabela “Anna” Arispe was born in Odessa June 14, 1953. She married Adam Vejil September 8, 1995 in Odessa. She works for the City of Odessa. 1920, 1930 and 1940 U.S. census records. Brewster County birth, marriage and death records. Felipa Hernandez Arispe obituary, Odessa American, March 13, 2011. Pablo Arispe, Sr. obituary, Alpine Avalanche 19 January 1989, obituary files, Archives of the Big Bend, Sul Ross State University, Alpine, Texas. Chisos Mining Co. records from the Peter Koch collection, Archives of the Big Bend, Sul Ross State University, Alpine, Texas. Indexed (brief) versions of birth, death and marriage records, accessed via Family Search.org, a service provided by The Church of Jesus Christ of Latter-day Saints.